I've spent a lot of years accumulating yarns, threads and fibers for what use I was never sure. It was most often the case that I simply couldn't leave the shop I was in without a particularly gorgeous fiber. Enamored by often breathtaking colors, I simply found these fibers stimulating to look at and inspirational as an artist. 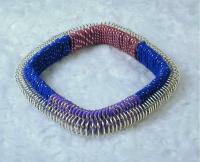 It also took me several years to learn how to incorporate those gorgeous fibers into my wire jewelry work. I tried unsuccessfully to use the fibers alone to make jewelry but I just couldn't get it to look right. When I started combining the fiber with wire however, I found my niche. Fiber and metal combined provides a unique opportunity to add color to your wire jewelry pieces. The metal provides the strength and stability jewelry requires as well as adding the contrast of metal's shine and sparkle. Colored fibers can take your breath away. Combine them and you have a match made in heaven. EAR06 - "Mia" earrings are made using a simple coiling technique with a few extra twists. One of the great things about these earrings is that the wire you build the earrings on turns into the ear post for easy and elegant construction. This construction method also produces a very sturdy and reliable earring. EAR05 - "Tyler" earrings were named after an old friend of mine who reminds me of the look and feel of these earrings: she's down to earth, open and free. These are some of the simplest earrings to make. Built on a bead base, you just use a very simple fiber and wire combination technique to create these. 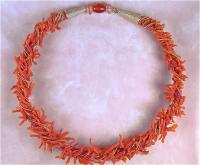 NK04 - It's hard to resist the vibrant color and texture of red coral. Having had these strands long before they became sparse, I wanted to do them justice by making something truly gorgeous with them. CB05 - This “Mia” ensemble is both warm and sensual, resonating with color dotted with tiny touches of silver. 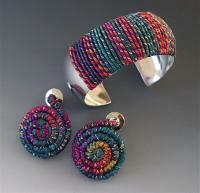 “Mia’s” vibrant color combines so beautifully with silver that everyone will be asking you where you bought these! 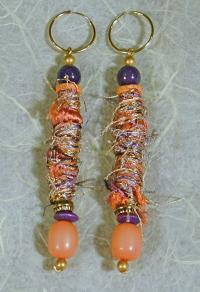 EARO1 – “Tyler and Mia” Fiber Wire Earrings. Two different fiber wire earring projects and techniques. 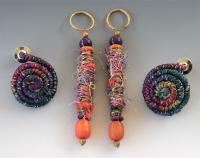 “Tyler” will show you how to build simple wind beads on a bead base and “Mia” will teach you how to make a twist, wind and coil “wiber” (joint strand of fiber and wire) and turn it into a gorgeous spiral earring. CB04 - I’m of the opinion that using fiber for jewelry making works best when the fiber is combined with wire. “Susie” Bangles is a good example of that. 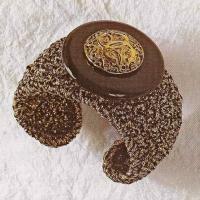 CB10 – “Goldie” Crocheted Fiber Wire Cuff. Have you ever wondered what would happen if you crocheted with both wire and fiber at the same time? Well, Goldie will teach you how to do just that. The real advantage to crocheting with both of those strands is that you can create a sturdier crocheted piece of jewelry.